Right that is all from us. You've got two and half hours to entertain yourselves until Match of the Day is on. Watch Strictly Come Dancing, make a bit of tea and before you know it, football will be on the box. Don't forget, you can also follow MOTD online with Match of the Day Social. We'll be firing that up at 22:15, so get involved. See you later. We are just about to wrap up here, but if you fancy some football with a continental flavour to it, then pop along and join my colleague Emlyn Begley for Barcelona v Rayo Vallecano. Goals galore at the top of the bill tonight. Tune in on BBC One, 22:30 BST. Alan Eapen: Good second-half performance from Arsenal. Need to break down even better defensive teams to win the league. Doctor Hevness: A deserved victory and the bonus of a clean sheet away from home. Well played Arsenal. Max Baggins-Craig: Such a harsh loss for Watford. Hopefully onwards and upwards from here. Quique Sanchez Flores stopped short of saying Arsenal are the best side Watford have faced so far this season, adding: "There is not a lot of difference between Manchester City and Arsenal, they both have amazing players." Watford boss Quique Sanchez Flores, speaking to BBC Sport: "I'm a little frustrated. In the first half we played really well. Eleven goals scored and just one conceded between the three teams at the top of the Premier League in their games today. It looks to be shaping up for a very open and entertaining battle for the Premier League title. Relentless is clearly the word of the day for Arsene Wenger. "Alexis Sanchez is relentless going forward," he adds. "He always looks dangerous and he is always dangerous. He is very important for us." Arsenal boss Arsene Wenger, speaking to BBC Sport: "It was an important win for us. You could see why Watford have not conceded many goals at home. They are strong and very direct and we could not make a mistake. Hard to pick between Alexis Sanchez and Mesut Ozil for man-of-the-match for me. Sanchez probably just about shades it. He has been electric for club and country recently, scoring 10 goals in his last six games. Nikhail Raghav: Do I smell a genuine Premier League title challenge this season? What a commanding second half performance! Thomas Norton: I've been a big critic of Ozil, but he is finally playing well. Yet to justifiy is price, but we will if he continues like this. "Watford can take a lot of heart from the first 60 minutes, where they matched a Champions League team. "They will be disappointed with how they reacted to falling behind - Arsenal's second goal came very quickly. "Just think if the Hornets had scored one of their first-half chances..."
As has already been said on this page, no shame in losing to Arsenal. They turned on the style in an 11-minute spell that few sides would have been able to handle. Signs of encouragement in that performance for Watford. Arsenal move back into second place, two points behind Manchester City. Watford, meanwhile, are 14th, six points clear of the relegation zone. The free-kick is flicked behind but no time for a corner. All over. A free-kick for Watford. Last chance for a consolation? They've certainly deserved a goal. Up goes the fourth official's board and there will be three minutes of injury time. Troy Deeney looks absolutely exhausted but he is still giving it his all, winning possession before hitting a very tired shot wide of goal. How has he not scored in the Premier League yet? "Disappointing for Watford, who were excellent for the first hour. But there is no shame in losing to Arsenal, an excellent footballing side." Arsenal are cruising back up to second here but no shame in the defeat for Watford. For an hour, they gave as good as they got and caused Arsenal more than a few moments of worry. Great work from Olivier Giroud as he attacks some space to meet a corner, directing a powerful header towards goal that brings out a good save from Heurelho Gomes. Watford fans breathe a sigh of relief as Alexis Sanchez goes off, but coming on in his place is Alex Oxlade-Chamberlain. His pace against a tiring defence is not what the home fans will want to see. Mikel Arteta also comes on for Arsenal, replacing Mesut Ozil. Watford also make a substitution as Ikechi Anya is replaced by Juan Carlos Paredes. I've seen a few critical comments about Aaron Ramsey's performance before his goal but he has worked hard today, getting up and down the pitch and, although he failed to score from a couple of good chances earlier, he was getting in the right positions. Faddi S: Form is temporary, class is permanent! All the Ozil detractors need to learn that. Efultang: Arsenal picked Watford apart there with pure class. No respite! Devastating football from Arsenal as they twist the knife further. Hector Bellerin plays a pass for Aaron Ramsey and the midfielder's shot deflects off the unfortunate Ikechi Anya, catching out Heurelho Gomes who can only watch as the ball lands in the back of the net. Game, set and match. Watford make their first change of the game as winger Steven Berghuis comes on for. A thankless task to come on at this stage of a game. Arsenal did not have things their own way for large periods of this match as Watford gave them a real tough test, but the Gunners slugged it out before effectively wrapping up the win with six deadly minutes. The sign of a title winner? What an impact! Olivier Giroud has been on the pitch a matter of minutes but he makes a crucial contribution as Mesut Ozil cuts the ball back for the striker and he drives home from the middle of the area. Despite the goal, Arsene Wenger presses on with a change as a very quiet Theo Walcott is replaced by Olivier Giroud. Arsenal have barely had a sniff of a chance in this half but with Alexis Sanchez in their side, they are always a danger. So it proves as Mesut Ozil weaves his way into the box, he looks to be fouled but it doesn't matter as the loose ball falls to Sanchez, who lashes in from close range. Harsh on Watford. Yellow for Arsenal defender Per Mertesacker after he lunges in on Odion Ighalo just as the Watford striker tried to get away on an attack. "Arsenal are pinning Watford back now, playing excellent, patient football. Watford needs to regain a bit of possession, just to take the sting out of the game." Better from Arsenal as Mesut Ozil and Alexis Sanchez combine, before the latter lets fly with a low shot that Heurelho Gomes has to push behind for a corner. That comes to nothing and Arsene Wenger gives Olivier Giroud the nod to warm up. Aaron Ramsey floats a cross into the area, but it is too slow and too close to Heurelho Gomes, who has plenty of time to stroll off his line and make the catch. Have to agree Flobalob (not something I thought I'd ever write). Arsenal definitely look a little unsettled by Watford's physicality. Seven minutes into this half and they are yet to string any meaningful passes together. Flobalob: Arsenal are getting bullied by Watford so far. Paul Collins: I wonder what Ramsey has do to be dropped. Sorry, but he's not done much at all this season. Needs a break from the first XI for a bit. Eddie: Ozil needs to help Sanchez grab this match by the scruff of the neck. Arsenal pedestrian so far. We have our first yellow card of the game as Watford's Nyom goes in the book for a bit of time wasting. Wa wa waaaaa. Comedy music needed as Heurelho Gomes horribly kicks the ball out into touch. Ironic cheers from the away fans, possibly even some home fans too. In fairness, it was the frightening image of a charging Theo Walcott that unsettled the Watford keeper. No changes at the break as Watford get the second half up and running. Max Baggins-Craig: Well well, a deserved HT 0-0 for Watford, seeing some good old fashioned football by them. Arsenal's CL form kickin in perhaps? It was probably to be expected that Arsenal would dominate the possession stats. They initially looked like they had continued from where they had left off against Manchester United with an aggressive start, but the longer things did not go their way, the more the tempo of their play dropped. A change needed at the break? The pace of Alex Oxlade-Chamberlain could help unsettle a largely untroubled Watford defence. The home fans applaud their team off. Watford have done a good job on Arsenal so far. A tough evening for the Gunners. They had a chance just before the whistle blew, but Aaron Ramsey fired wide. He's not got his shooting boots on today. Where's Walcott? I've barely mentioned him in this half after an early chance. He's not seen too much of the ball, having had 13 touches of it. Arsenal need to get him into the game. Cheers Derek. I guess I may not be in the minority after all. Almost a moment of embarrassment for Arsenal as Petr Cech comes out of his box to close down a ball over the top. Per Mertesacker attempts to hold off Troy Deeney, but heads the ball on to the top of Cech's arm. Home fans appeal for handball, referee waves play on. "Watford have more than held there own here, and the Hornets players can be proud of their performances so far. Great entertainment for the home crowd." Dr Spits: Somebody do a Ramsey horrible misses compilation, so we can see if there's a scenario he's yet to miss from. Shohidur Rahman: Watford are a proper old school side. Two banks of four then the two up front linking with each other. Like it. Charles Meyrick: Arsene Wenger is Arsenal. I dread the day that he leaves us. He's welcome beyond 2017 as far as I am concerned. The ping pong nature of this match continues as Arsenal follow up Watford's chance with a couple of their own. First, Nyom superbly stabs behind Hector Bellerin's inviting ball across the face of goal, before Laurent Koscielney shoots wide from the corner. Did you know (I'm sure you did) that Alexis Sanchez and Odion Ighalo go way back? The two were team-mates at Udinese between 2008 and 2011. Both have been heavily involved for their respective sides in this half, but neither have had a real chance on goal yet. Ighalo helps build another Watford attack as he feeds a pass to Nathan Ake, but he gets his shot all wrong. 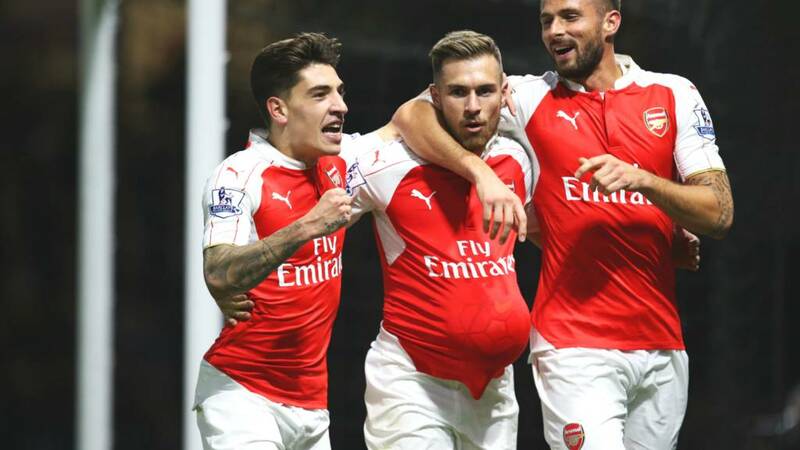 "Ramsey should finish that [at 28 mins], having made such a great run. His body position was not quite right, but after the great intricate play from Ozil showing Arsenal at their best, what a waste." The hosts go straight up the other end of the pitch and Odion Ighalo races clear. The top scorer in English football in 2015 must surely score? No. He uncharacteristically stabs wide. Should have done better. This, though, is what Arsenal are capable of. Watford are seemingly in no danger as Alexis Sanchez has the ball about 35 yards from goal. Over on the far right of the pitch, Aaron Ramsey has his arm up and he is racing into the area. Cazorla flights a ball beautifully but Heurelho Gomes is out quickly and blocks Ramsey's shot. Ramsey gnashes his teeth in frustration. A second Arsenal corner as Alexis Sanchez's attempt to cross is stubbed out, Santi Cazorla curls the ball in but the busy Troy Deeney is back to head away. Watford look like they have goals in them, but the stats suggest they don't. Not at home anyway. Four games played at Vicarage Road in the Premier League this season by the hosts and they have scored just the one goal. They have only conceded one, mind. This might not be as easy as Arsenal fans may have thought prior to kick off. "Great build-up play from Watford, but I must give Koscielny praise. It was a great goal-saving sliding interception, just putting Deeney's cross behind for a corner." Danger, danger! Suddenly Arsenal are caught out at the back and it is two against one with Troy Deeney leading the charge, he attempts to square the ball to Odion Ighalo, all alone on the far side of the area, but the pass is cut out by Laurent Koscielny. If he messed that up, it was 1-0 Watford, no doubt. The Arsenal defence is getting a bit of a workout as Odion Ighalo pulls the ball back from the right side of the area for Ikechi Anya in the middle of the box. He stops the ball and then flicks it to the feet of Troy Deeney, but he can't get his shot off in time before Hector Bellerin moves in to clear. Having said that, a warning for Arsenal as Troy Deeney shrugs off his marker and has a go from just outside the box, but Petr Cech is behind the shot. There's a good chance this possession graphic might not change much as the game goes on. Arsenal certainly look determined to build on their win against Manchester United and Heurelho Gomes looks set for a busy afternoon as he is tested from range by Alexis Sanchez, palming away the Chilean's stinging effort. Watford are certainly making sure Arsenal have as little time on the ball as possible, moving quickly to close down the man in possession. A loose ball squirms out to Santi Cazorla just outside the area, but his long-range effort is charged down and blocked. The Gunners go a little closer soon after as Aaron Ramsey clips a smart ball into the area for Theo Walcott, it falls just in front of the forward but Heurelho Gomes is quick off his line to pluck the ball from the air. An early corner for Arsenal as Nyom heads a cross behind. It is little more than catching practice for Heurelho Gomes, though. Arsenal kick things off, and away we go. They had scored three goals against Manchester United inside the first 20 minutes last-time out, will they make a similar start to this game? Hugh Laurie, I mean Quique Sanzhez Flores, gives some last-minute instructions to Odion Ighalo. A proud moment for Watford's Troy Deeney as he leads the Watford team out holding his son's hand. Deeney junior is the Hornets' mascot for today's game. "We've planned in a great way. We must try to match their play and attack ourselves." What do you think Arsenal fans? Is it time for a change, or have you seen enough quality this season to suggest the Gunners are genuine challengers for the title? Watford fans, just how good has Odion Ighalo been this season? And are you confident of staying up? Get involved via #bbcfootball, text in on 81111 (UK only) or have your say on the BBC Sport Facebook page. "Wenger had had a fantastic run. He has done enough to create his own exit strategy, which is rumoured to be 2017. And I expect he'll have an influence on his successor. "His replacement? I think Ancelotti would be a great fit for Arsenal." Rumours emerged earlier this week that Arsene Wenger could retire in 2017, adding greater importance on Arsenal challenging for a title this season. "I think we are back in contention and we have a good chance," he said. "All of our numbers confirm that we have the potential to be in the fight." Not only does Odion Ighalo like the song "Gold" but he evidently has a heart of gold too. Every month he sends a portion of his wage back to his native Nigeria to ­charitable causes. “I send money to kids, to schools, and I’m taking care of around 45 widows, women who have no husbands, and I’m trying to start a charity organisation to give something back," he said. The player Arsenal undoubtedly have to be wary of tonight is Odion Ighalo. He has been a revelation for Watford this season, scoring five goals in eight games, and is so loved by Hornets fans that they have taken to belting out Spandau Ballet's "Gold" whenever he scores. Now he wants the band themselves to rock up to Vicarage Road and lead a rendition of the song. “It would be great for them to come to a home game and conduct the fans," he said. "I don’t know them but the first time I heard the song, I was so proud. “Every time I hear the fans sing ‘Always believe in your soul’ it brings me joy because it means they are with me and it gives me the incentive to fight for them." The BBC Sport Predictor game pits fans of Premier League clubs against each other. Watford supporters (fourth) and their Arsenal counterparts (sixth) have been doing well in our table - so far. Arsenal need a win not only to prove they can string a few good results together this season, but also keep on the heels of a free-scoring Manchester City. The league leaders moved five points clear of the Gunners by beating Bournemouth 5-1 earlier this afternoon, while wins for Manchester United and West Ham have dropped Arsene Wenger's side down to fourth. Theo Walcott was particularly impressive against Manchester United earlier this month and he continues up front for Arsenal, with Olivier Giroud on the bench. Alexis Sanchez has shrugged off a hip problem and defender Laurent Koscielny also starts after recovering from a hamstring injury. He replaces Gabriel in the Gunners' only change from their win over Manchester United. Will it be Dr Jekyll or Mr Hyde? Brilliant one week, poor the next. Arsenal have struggled for consistency this season.Image caption: Brilliant one week, poor the next. Arsenal have struggled for consistency this season. "Rampant", "devastating", "electric". Those were just some of the words used to describe Arsenal's comprehensive defeat of Manchester United last-time out. The Gunners' stunning dismantling of their rivals suggested they have the quality to be genuine title contenders this season. But for every 3-0 win against Manchester United, there's been a 2-0 defeat at home to West Ham equivalent. Consistency is Arsenal's chief problem. Will they rid the Jekyll and Hyde nature of their performances this season by claiming a convincing win today?